With every new Just Cause game, the rules of real life get a little further away. By the second one, the grappling hook let you stick things together in ways that were impossible. In the third game, the wingsuit inexplicably let you glide across environments like a flying squirrel, which I'm pretty sure would kill me instantly in real life if I tried it off the hill where I live. In the fourth one, you can tie balloons to your tank and program the balloons to follow you around, meaning you now have a flying tank. New grappling hook mods, heightened simulation of destructible objects and mad weather are the things trying to keep Just Cause fresh this time. You can attach balloons to objects, and program those objects to follow you around, or attach a booster to make it fly off, or a number of other things. Weather, though, is the easiest sell to anyone watching a trailer: I've seen tornadoes and lightning storms up close, but not its promised blizzards and sandstorms yet. At Gamescom 2018, I went hands-on with the game and watched a brief presentation of some fun new stuff. We've explored how tornadoes work before, dragging objects, vehicles and people into their path, and how the enemies in Just Cause 4 use 'wind cannons' to control the tornado. Weather effects creep into your armoury, too: you can equip a wind gun, for example, that has a secondary fire powerful enough to knock down a radar tower. In the hands-off presentation, they explain how lightning works—it'll strike the highest object, naturally—and show off the variety of areas in the game. They call this the 'biggest and most varied world' of the series, which to me highlights the struggle Just Cause has always had in giving its gigantic environments any kind of identity, even though they always look pretty. We see grasslands, desert—where a sandstorm is amassing in the distance—and snowy mountains, all of your favourite biomes. During the hands-on session, where Rico has to destroy the aforementioned wind cannons, I get a sense of the drama that goes down when a tornado sweeps through a base. It does look very cool as it consumes numerous objects lying around, and when you're too close to it, you'll get sucked in and need to use a grappling hook to get out. I feel like this extreme weather gives Just Cause the kind of open world 'event' that it really lacked before—how frequent they are, and how much they can affect the game in different circumstances, is what'll determine whether they're more than just an exciting novelty. It's how destructible objects are simulated that will help make these weather instances interesting. 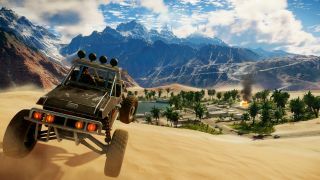 "In Just Cause 3, what happens the moment you shoot a fuel tank is a timer starts to make the object explode after a few seconds," explains game director Francesco Antolini. With Just Cause 4, though, a fuel tank becomes a weapon you send in any direction based on where you shoot it. "When you shoot the fuel tank on the right hand side, you're going to get flaming gas that will propel it this way," Antolini gestures. "This means you can decide where this thing gets shot." "We're all about discovering new things in the environment, whether it is discovering new objects you can destroy, or new ways you can destroy those objects," says systems designer Maria St Martin. "With the fuel tank, for example, it behaves differently if you're in a tornado—it starts rotating—or if you're in a thunderstorm, it's going to behave differently because the wind is different as well. In addition to that, all of our weapons have secondary fire, so they all do different things as well. "My favourite is the shotgun, for example. Secondary fire for the shotgun is like a ricochet shot, so you can shoot it anywhere and it starts ricocheting different places. Combining all of those things creates so much variety, so many opportunities for players to explore however they want to play the game." The numerous new grappling hook options and exciting weapons help make this feel like more than simply Just Cause 3 with weather—but I always have the same fear with this series, no matter how enjoyable the new features sound. It's that I'll just mess around with all the cool stuff for somewhere between four and ten hours, jump off a mountain, ride an airplane, find the Easter Eggs around the world then uninstall it, without feeling much compulsion to do any of the story missions. It's basically what I did with Just Cause 3, despite playing the second game for tens of hours. It feels like Avalanche has spent a lot of time thinking about how to keep players experimenting hours into the game—and hopefully they'll be more than just novel additions to a template its audience is now very familiar with.